Last year I shared how to save money with Groupon which is a daily deal site. 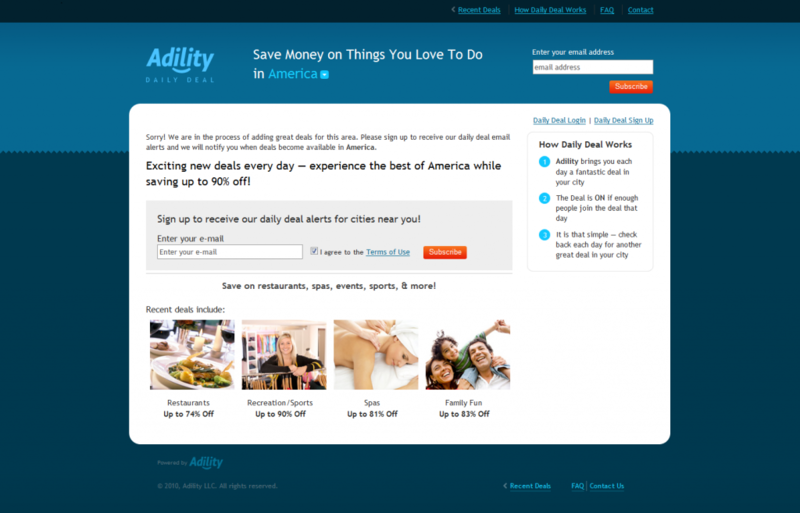 Adility Daily Deal is another site that has resulted in savings on things I would have bought at higher prices anyway. It’s a competitor site to Groupon that offers weekday emails with one bargain service in whichever of the 40 plus cities you selected. If enough people buy it, “the deal is on”. As you can see there is a wide variety and usually significant savings. I took advantage a couple of months ago of an offer by a nearby salon that included one free cut and style, two facials, one spray-on tan and 20% off waxing services for six months for the price of $40. There is a shipping and handling charge of $1.50 per order as the certificates are handled by mail service. I received my certificate within a week after the close of the sale. I made an appointment at the salon and have been back several times now and have found a new stylist. That reminds me, I need to make that spray tan appointment so it looks like I live in sunny California! The only complaint I have is about that shipping and handling fee. Other daily deal sites fulfill orders online and don’t charge a similar fee. If you live in or near one of the cities served by the daily deal there’s no harm in signing up for the emails. The offers are still unique enough to make them worth buying if it is something you need or would use. Who knows, you might just find a new stylist! Have you ever tried Adility? I haven’t tried Adility and don’t know if I will. Although I grasp that it can help me find discounts on some cool events/services, I wonder if I would have otherwise gone to the events in the first place. In other words, I wonder if the end effect on Adility will be to increase my expenses? It sounds kind of funny but it could possibly be true. Roshawn, that’s a good point. I only buy things that I would be paying for anyway but I could see how people might buy them just because “it’s such a good deal”. i have never heard of Adility…i get the Groupon emails throughout the week but have not heard of Adility. James, hopefully the offering near you are useful! If you live in the Denver or Phoenix area I would encourage you to go to http://www.weeklyplus.com. The deals are daily but online for one week, meaning there are 7 deals going on at a time. The good thing is if you don’t check your email daily you can still get the deal, or if you want to think for a few days about the deal, instead of rushing to buy because you only have a day to, you can.